Google has just confirmed that the rumors last night of Google Voice being integrated into Gmail are not only true, but is also already available to many Gmail users across the US, with international availability yet to be announced. While the new feature integrate Gmail and Google Voice features together into a new interface for making calls from within your inbox, you don’t necessarily need a Google Voice account to use it. This is because calls to the U.S and Canada will free, at least through the end of the year. Though a Google Voice account is required to purchase credits for international calls. Pricing appears to be quite competitive, with 2 cents a minute rates to France and the UK. A full list of rates for international calls is available here. 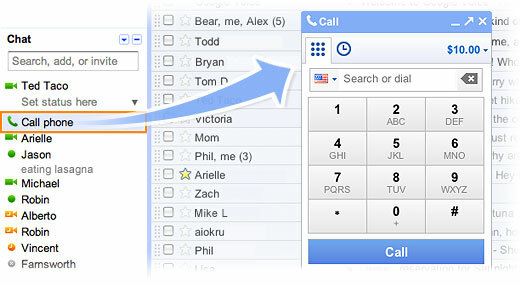 Google to Introduce VoIP Client For Calls From Gmail Inbox Tomorrow?